I-Sphere Intelligent Ball | www.vertechs.com | Vertechs Oil & Gas Technology Co.
Vertechs i-Sphere intelligent ball is designed to collect downhole temperature and pressure data in various well conditions. 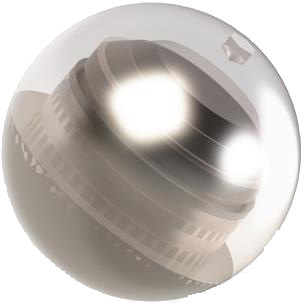 Comparing to traditional methods of acquiring P/T (Pressure and Temperature) data, Vertechs i-Sphere intelligent ball has independent power supply and memory, it does not require deploy tools, which benefits the operators in the long-term by providing a cost-efficient way to collect the downhole P/T data by eliminating the interference to the operation progress. Can be used under other conditions when wireline logging or slick line logging is not available. If you need a frac ball, we can make it smarter. *Service time depends on downhole conditions and data recording rate.